The third of our students to join our UK Scholarship Fund is Lourdina Baboun from Bethlehem. This is yet another interview that will tell you a bit more about our musicians. Palmusic UK: Tell us a little bit about you, where you come from and what you do? 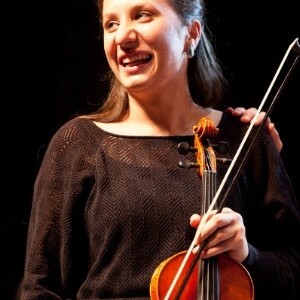 Lourdina Baboun [LB]: My name is Lourdina Baboun, and I am a Palestinian violinist from Bethlehem. I have studied at the Edward said National Conservatory of Music (ESNCM) in Bethlehem for the past 8 years where I also obtained my degree. Afterwards I moved to France to continue my studies as a violinist. At the moment, I am at the Royal Birmingham Conservatoire doing BM studies. Palmusic UK: Why did you decide to apply for this scholarship? the expenses here in England are very high, and I needed support to help me achieve my goal. Palmusic UK: How did you learn about Palmusic? Lourdina Baboun [LB]: I have played at a fundraising concert for the ESNCM in London, and Palmusic UK had organized the concert and all aspects relating to the event. That’s how I learned about the scope of work Palmusic UK do. Palmusic UK: Is this your first time away from home? Lourdina Baboun [LB]: No, I have been away before when I moved to France to study for my BA degree there. I studied for three years studies in France. Palmusic UK: What are the things that you are looking forward to the most? 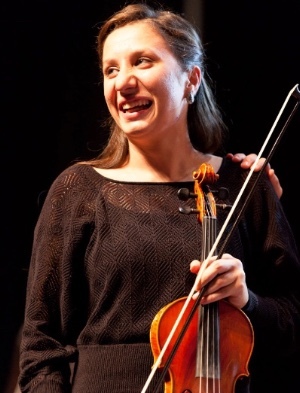 Lourdina Baboun [LB]: Certainly becoming a better violinist and presenting myself as a Palestinian violinist from Bethlehem. I’d like to show people that when you believe that “Where there’s will there’s a way” there truly is a way. Palmusic UK: What do you think will be the biggest challenge for you being away from home? Lourdina Baboun [LB]: Building a stronger personality is always key. When you build it, you won’t have challenges away from home. On the other hand, the challenges of studies and what they entail will be hard, because I will be alone and I will need to solve everything on my own. Palmusic UK: Do you think that this experience will have a profound effect on your life? Lourdina Baboun [LB]: It will, and it has already happened when we found out that our conservatory is now a ROYAL conservatoire. There will be a lot of hard work on our way, and I am sure through the years we will attend many masterclasses and workshops that will help me become a better violinist. I know that being here is a big responsibility for myself and then for everybody who has helped me to get to where I am now. Palmusic UK: In what ways do you think will this experience influence your development? Lourdina Baboun [LB]: The opportunities that I have in this conservatory are very important and special, making the most of these experiences will no doubt help me develop. Palmusic UK: What are your hopes and wishes for the future in terms of your career? Lourdina Baboun [LB]: Everybody has a vision and I have one as well, but in order to achieve what I want I first need to know well what I should be doing this year; set targets that I want to achieve and to improve. When I attain that throughout the time I spend here in England and when I do it the right way, I will be ready to say and do what I want.